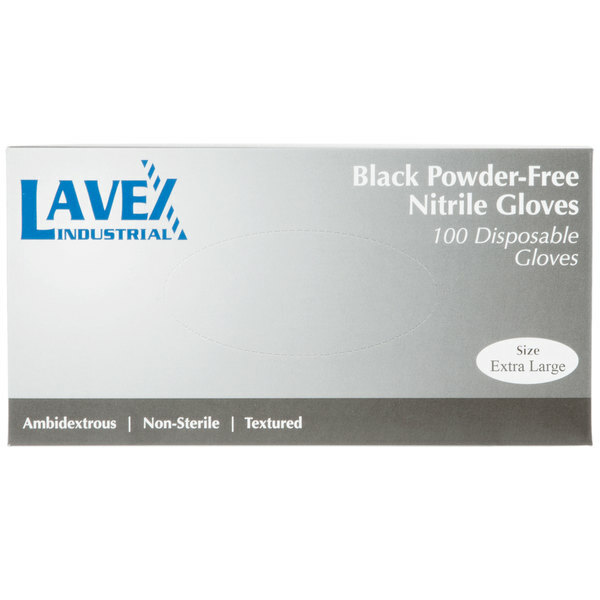 For even the toughest commercial jobs, choose these Lavex Industrial 5 mil thick, powder-free extra large nitrile heavy-duty gloves to complete the task. 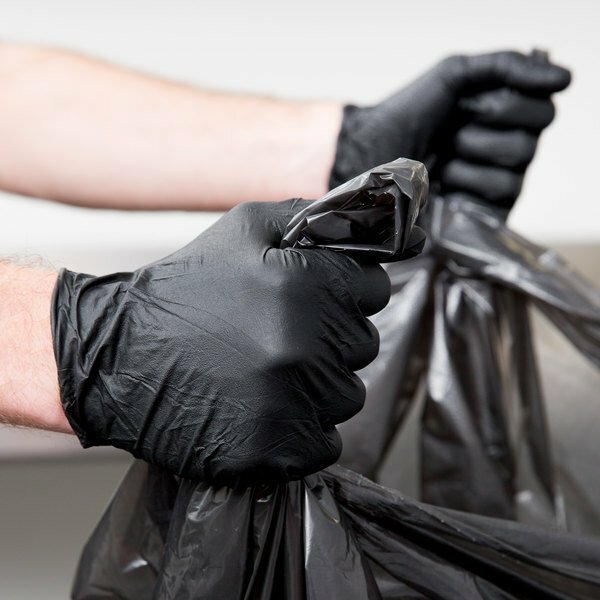 Be sure to be equipped with the essentials with these black nitrile powder-free gloves! 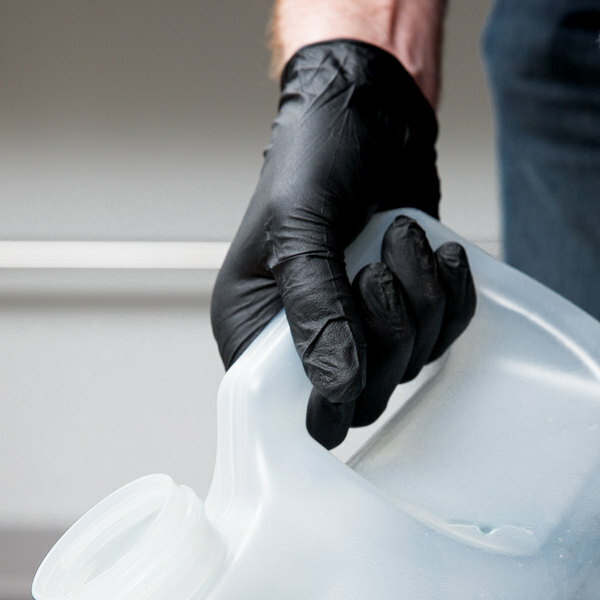 Great for tackling jobs in the automotive industry, tattoo work, salons, and janitorial or industrial applications, these heavy-duty gloves are thicker than standard latex gloves to resist wear and tear, with the textured material provides extra grip. "These are our favorite gloves. Price point is good and even slip on easily when your hands are wet. We will be purchasing these again!" These nitrile heavy-duty gloves are specially designed for tough jobs. They can be used in the automobile industry, tattoo and piercing studios, salons, janitorial, and even industrial applications. Law enforcement officials or EMS workers can benefit from them too! 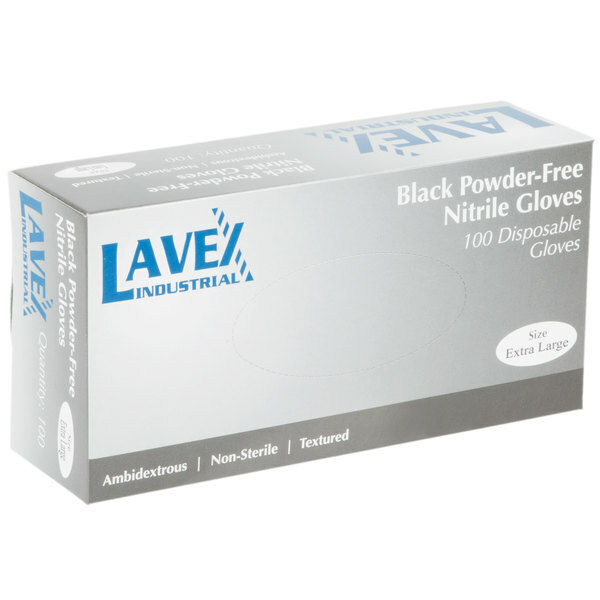 These black powder-free gloves are made of durable, 5 mil thick nitrile, which is allergen and latex free. The material provides exceptional puncture, tear, and chemical resistance while maintaining the tactile sensitivity of comparable latex exam gloves. The extra large size allows you to have gloves ready for those employees with larger hands. By stocking a variety of glove sizes you can be sure all employees will be able to complete their tasks with ease and efficiency. The box doubles as a dispenser, keeping things orderly in your commercial kitchen, garage, or tattoo parlor. For more storage flexibility, you can purchase a wall mount glove rack (sold separately). 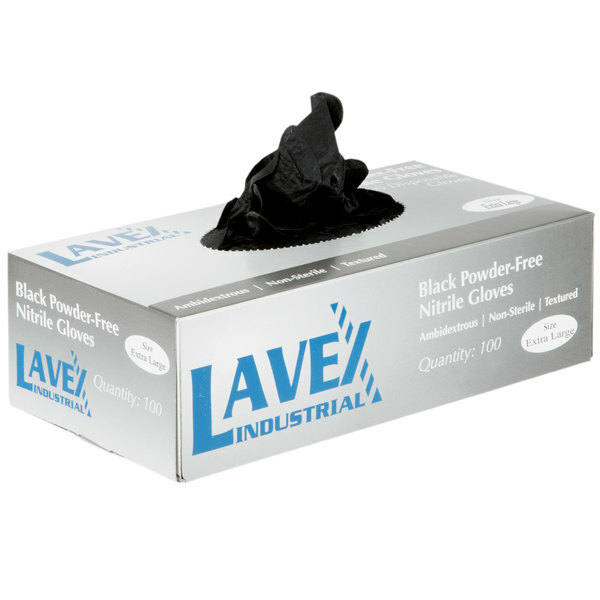 The Lavex indsutrial 5mil thick gloves are the only ones I will ever use. I have very large hands and these are the only ones that can handle them. Others rip right through like the hulk. Can't say enough great things about these gloves. We use them when grilling and handling meet. They protect our fingers from getting burned unlike the 4 mil gloves. These gloves are perfect for my large hands. Super durable and I love using them to do stuff around the house or on the backyard. 3 mil tear easily, but these hold up very well. These are our favorite gloves. Price point is good and even slip on easily when your hands are wet. We will be purchasing these again! 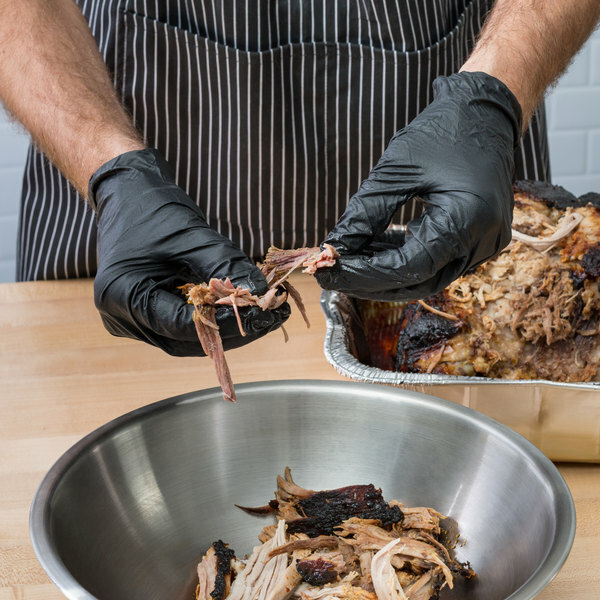 I own an outdoor food booth, and many of my customers remarked on how classy and just overall, "neat" the black gloves looked when my food servers used them while handling food. These black gloves are heavy and great quality. I have not been able to find this color of gloves anywhere else, so of course, I will order more. If you want a thicker Nitrile glove look no further. I was skeptical when I ordered these but went out on a limb. My expectations were completely blown away. The gloves are thicker than anticipated and the texturing which seemed like a joke is amazing. I was able to hang onto a wood handled knife covered in fish slime and never lost my grip. The only drawback I had was the sizing. It does clearly state to order a size larger. I would actually order two size larger. Other than that this is a great product. I have found that I am using few gloves with this product because of their durability. A great and efficient price! these nitrite gloves are heavy duty and powder free. The fingers have a textured grip and they fit tight to the hands. Whenever I’m serving food I find that a nice fitting set of serving gloves is paramount. These gloves offer a superior fit over others that I’ve tried. These gloves also boast an incredible texture that makes for the best grip that I’ve ever had while using black nitrile gloves. 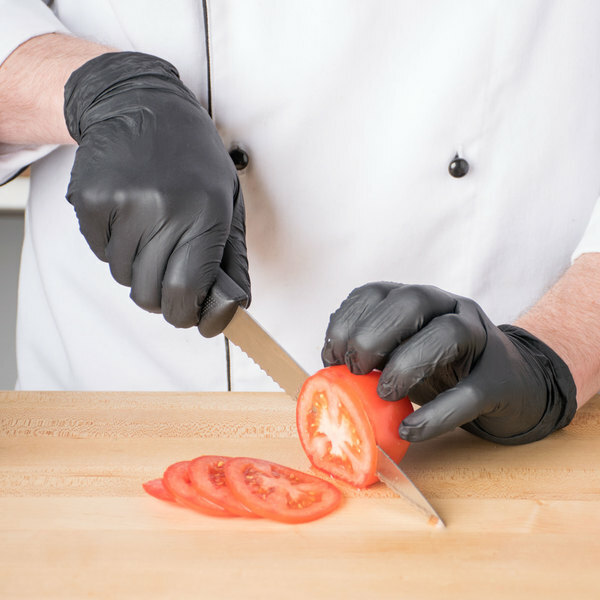 Perfect gloves for handling raw meats and poultry, as well as janitorial needs. Tear resistant and perfect for a busy kitchen! Great price as well! These gloves are so mobile and thick that they actually work well even if they are a little small or big for your handsize- they are very forgiving in that sense and they work you don't get any smell or garbage on your hands when doing the dirtiest job and they don't even get holes easily!